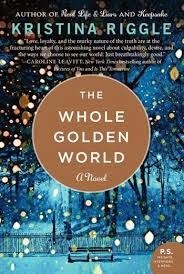 a book chick: "The Whole Golden World"
my take: After finishing a self-help nonfiction, I was looking for something easy and fast. And this fit the bill very nicely. This is my third read from Kristina Riggle ... I like the reliability of her writing ... and I like the beachy read qualities of great characters & plot line and effortless reading. The story line is "ripped from the headlines": a student-teacher love affair (I'm not giving much away because this comes out in the first chapter) told through three different women. I can imagine the author seeing or hearing the story in the news and wondering how such a romance happens and letting her imagination develop the backstory. This reminded me a little of Amy and Isabelle by Elizabeth Strout (which is also a good read).